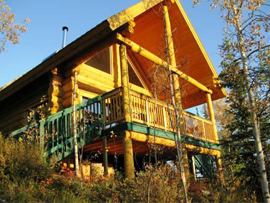 The Yukon cabins overview the Tahkini River and offer a wonderful escape! Located only 20 minutes from downtown Whitehorse. Views include the Ibex Valley. We offer three completely different cabins, from rustic to luxury, for you to experience. Check out the following pages to learn more! Muktuk Ranch is a pet-friendly establishment, however, we do remind our guests that our dogs are our top priority. Please read about our Pet Policy > Trip Details.